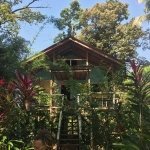 This is a unique opportunity to own a vacation cabin at a location that offers both snorkeling and nature walking trails. Built in the middle of 3 houses on elevated land with great views of the mainland mountains and a beautiful blue Caribbean reef, this is hard to beat. The longtime owner of the first house lives full time on the property. There is a caretaker on the premises and only requires a small monthly fee. The cabin can also be rented for additional income. The seller owns the other 2 cabins and would consider selling both cabins. The middle cabin is currently for sale and is 1200 sq ft and is built up a floor. The bottom floor houses all water tanks and solar power. A septic system is installed. The top floor has the kitchen, dining room, bedroom, bathroom and wrap around screened in porch. The structure is built with all local hardwoods. Good internet is also available. Located only a 15 minute boat ride to Bocas Town for supplies. The property comes with 3 acres of pure nature trails. Experience monkeys, toucans, many types of other birds, sloths and other wild life. Put your bathing suit on and snorkel a big reef system. This is truly a place where you should disappear in your hammock with a pina colada, listen to some island music and do the Bocas “chillout”. Come see us to book a viewing.